The Smartwool Mountaineering Extra Heavy Crew Socks are a merino wool sock intended for cold weather activities like winter walking and ice climbing. After your boots the socks you choose to wear arguably have the biggest impact on your ability to move across terrain. With the case in point being that even comfortable boots can be ruined by poor socks and vice versa; ultimately leading to uncomfortable feet (blisters or just general rubbing), reduced enjoyment and slower progress. A significant proportion of the cost of a product to a customer is dependent upon the cost of the materials used; these socks use merino wool (74% Merino Wool, 25% Nylon and 1% Elastane). Merino wool is a great material for outdoor products as it manages moisture extremely well, has a good warmth to weight ratio, is very breathable and is odour resistant (perhaps a particular benefit for socks). Also merino wool feels much softer than standard wool, but not only is the inclusion of merino wool important but the amount or relative percentage of it. Too much merino wool (and not enough nylon) and the sock wouldn’t be durable enough to handle the use, but too little merino (and too much nylon and elastane) and the sock wouldn’t be as comfortable to use. In actual use and testing merino not only feels more comfortable against the skin when dry but is particularly beneficial when in damp conditions compared to other wool / nylon socks. Merino wool has a noticeable advantage in managing moisture well; whereby even when wet it still feels comfortable without feeling saturated (like synthetic fibres do). Smartwool use their ‘Smartwool Fit System’ involving an ankle brace, arch brace and reinforced cushion zone. It’s unlikely that you will notice the additional support; however this does make the sock feel as though it has been tailored to your foot, with the shape tapering around your ankle and fitting snugly around your arch. The combination of the ankle brace, arch brace and reinforced cushion zone ensure a significantly more comfortable fit, with much less excess material to create pressure points and a sock which stays in place throughout the whole day. ‘Out the box’ comfort is amazing. The first time you put them on you will notice how soft the merino feels against your skin (i.e. increased comfort) and how well they fit. In actual use they keep your feet warm and dry (although your feet may still be wet, they feel more comfortable in a merino wool sock compared to nylon / polypropylene mix sock). Cost? At £24 they might seem expensive, however when a good quality / well featured waterproof jacket can cost easily in excess of £200 then why would something so important such as the comfort of your feet be overlooked? Sizing; although the size ranges are fairly standard for socks if you are at one end of the size range it can make it tricky to get a perfect fit (i.e. too tight a fit in one size but too loose a fit in the next size up). The Smartwool Mountaineering Extra Heavy Crew Socks are brilliant; ensuring comfortable feet in a range of temperatures and in spite of any dampness in your boots. 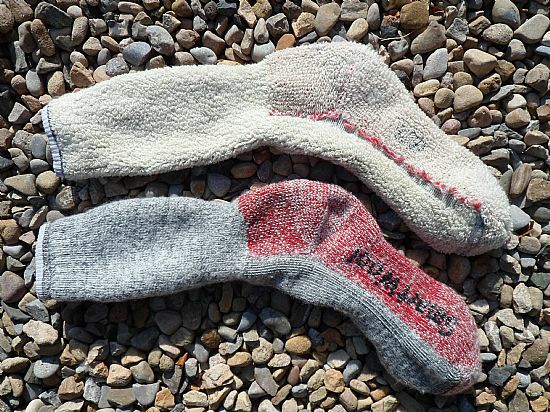 They will be a pleasing revelation to anyone used to synthetic socks, but high quality merino wool socks should perhaps also be seen as an essential item for anyone spending extended periods of time in the outdoors. The Smartwool Mountaineering Extra Heavy Crew Socks on review here have been provided by Outdoor Look.